Spring Theory claims that human beings have risen above the rules of nature. Whereas all the other species are motivated only when they are uncomfortable, Spring Theory claims that human beings are predisposed to go beyond resolving their discomfort. Unlike the animals, human beings will self-elevate and achieve a higher level in society if something doesn't interfere with the automatic process. It follows that when citizens perform poorly it is because something has gone wrong. Spring Theory points to social hindrances such as poverty, bigotry, deficient education and bad parenting as being responsible for the failure of citizens. 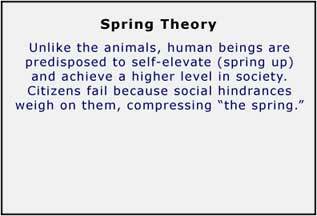 Adding the cause for the failure of citizens completes the definition of Spring Theory. Note that we have added two lines of text to the original definition in the box below. Animals are motivated to do just one thing — resolve their discomfort. Our house pets are perfect examples of how their animalistic nature affects them. They lounge around until they become aware of a biological or situational discomfort or survival need. Only then do they take action. Once they resolve their discomfort, animals go back to their lethargic and unproductive natural state. 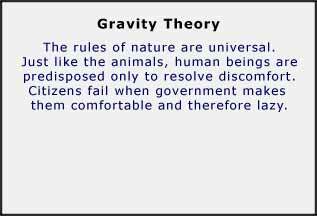 Gravity Theory claims that the rules of nature apply to human beings just as they do the animals. Therefore, if government makes citizens comfortable, they will become lethargic and unproductive. Adding the cause for the failure of citizens completes the definition of Gravity Theory. Note that we have added two lines of text to the original definition in the box below.